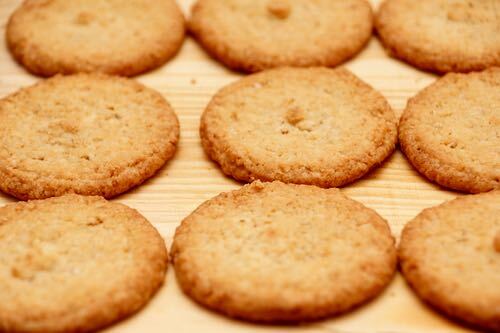 The refrigerator cookie recipes below will help you to bake your cookies faster and easier. Pre-made dough recipes evolved from the old fashioned icebox cookies. They became hugely popular in the 1950s, once refrigerators became commonplace in North American kitchens following World War II. 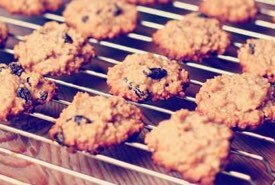 The dough for refrigerator cookies can be made ahead of time for slicing and baking later as needed for school lunches or snacks. This adds convenience, plus homemade dough is cheaper than using frozen store-bought dough, and the homemade cookies are tastier and healthier for you too. 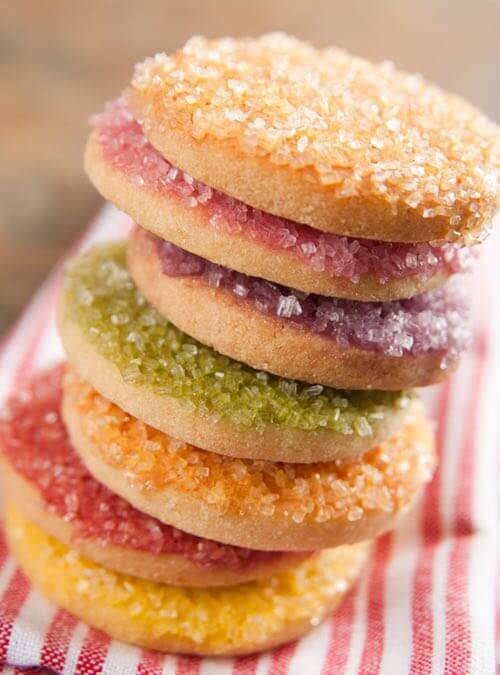 Enjoy the convenience of these vintage refrigerator cookie dough recipes. Simply mix the cookie dough now when you've the time to spare and then bake your cookies later, when you need them. Cream 3/4 cup butter, add 1/2 cup brown sugar and 1/2 cup granulated sugar, blend, and beat in 2 eggs. Add 1/2 cup chopped almonds. Measure 2-1/4 cups sifted flour and re-sift with 1 teaspoon soda, 1/2 teaspoon salt, 1/2 teaspoon cinnamon, 1/4 teaspoon nutmeg, 1/4 teaspoon cloves. Stir in butter and sugar mixture and mix. Shape into roll 2-1/2 inch in diameter. Roll in waxed paper and chill in refrigerator or icebox overnight. Then cut in thin slices 1/8 inch thick. Bake 5 minutes at 375°F. Makes about 40 cookies. 5 cups sifted bread flour, 1 tablespoon salt, 1 pound shortening (2-1/3 cups), store in covered container in refrigerator and scoop out when wanted. Add and mix 2 cups cookie mix, 1 cup brown sugar, 1/2 teaspoon baking powder, 1 teaspoon cinnamon, 1/2 teaspoon cloves, 1/2 teaspoon allspice. Mix well with 2 eggs, 1 to 2 tablespoons orange juice. Blend in 1 cup chopped nuts, 1/2 cup chopped dates. Drop by teaspoon on greased sheet, bake 10 to 12 minutes at 375°F. Add and mix well 3 cups cookie mix, 3/4 cup sugar, 1 egg, 1/2 teaspoon baking powder, 1 tablespoon water, 1 teaspoon lemon rind, 1 teaspoon almond extract. Chill if necessary. 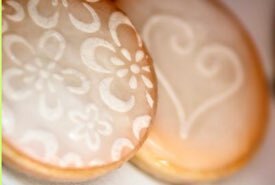 Roll to 1/4-inch thickness, cut into fancy shapes; e.g., wreaths, bells, Christmas trees, etc., decorate with colored sugar. Bake 8 to 10 minutes on ungreased cookie sheet in hot oven, 425°F. 2 cups brown sugar, 2 eggs, 1 cup butter, 1 cup walnuts chopped, 1 teaspoon baking soda, 1 teaspoon cream of tartar, 1 teaspoon vanilla, 1 cup almonds, chopped, 3-1/2 cups flour, 1/2 teaspoon salt.